In any manufacturing facility, there’s waste. Wasted materials, wasted time, wasted manpower, etc. And all of that waste adds up to wasted money. Therefore, a manufacturer’s main goal should be to eliminate as much of that waste as possible and make the entire process more efficient. To that end, many companies employ a process called Kanban. Kanban was first developed by Toyota as a method of facilitating Just In Time manufacturing (reducing manufacturing flow times and improving response times in communication with customers). Since then, Kanban has been applied to a variety of different industries and processes, from office work to software development and more. Its most popular application, though, remains in the field of manufacturing. So how do you implement Kanban as part of your own workforce solutions, to make your manufacturing more efficient? Here are a few of the basic principles. Kanban isn’t a specific process or set of instructions for success. It’s more of a general outlook that suggests a more efficient way of doing things. 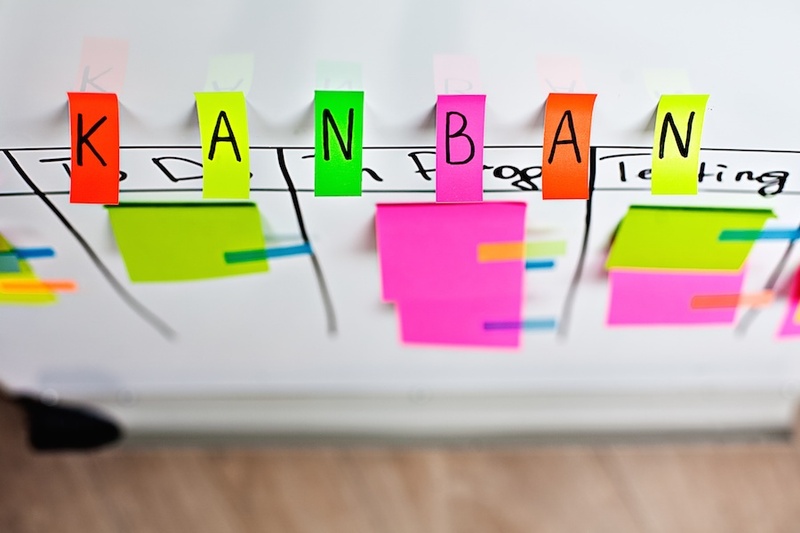 As such, implementing Kanban doesn’t mean a complete overhaul of your current policies and procedures. You can begin with what you’re currently doing and overlay the principles of Kanban on top of it, to make it more efficient. If something is working for your organization, keep it. If it’s not working, use Kanban to figure out how to do it better. Examine your organization carefully to see what needs to be fixed. Maybe it DOES need a complete overhaul. But even so, changing things all at once is detrimental. If you suddenly throw out the procedures your workers have followed for ages and replace them with new policies, those policies will be met with resistance, likely dooming them to fail. Instead, change things one at a time, starting with what’s most in need of updating. Slowly and gradually implement improvements, and let the system evolve into something better and more effective. Don’t throw the baby out with the bathwater. Whatever still works as part of your manufacturing process, keep it. When you make changes, make them within the parameters of your existing structure. Keep people in their existing roles and responsibilities as much as you can. When you do make changes, show your employees why and how these new methods of production will help improve productivity for everyone. In a typical workplace structure, particularly in manufacturing, management provides the leadership and lower level workers simply follow instructions. However, Kanban encourages leadership from all levels and all places. By constantly working to improve their own efficiency, workers can lead by example, by inspiring others to do the same. This is one of the most important principles of Kanban. Even if you recognize that your manufacturing process needs to be more efficient, it can be difficult to see where the specific problems are. Limiting work in progress allows you to see bottlenecks in the process more clearly. For example, only allow a certain number of products to be worked on in any one step of the manufacturing process, at any given time. Say you’re assembling swivel chairs. The section that puts the wheels on the bottom is only allowed to work on five chairs at a time. The people in the previous section, who affix the back to the chair, can’t send any new chairs to have wheels put on until there’s an open slot. If this leads to a big pileup of chairs with no wheels, then you know that some problem is making the wheel installation process go slower than it should. From there you can look at that and see what needs to be done to make that step more efficient. These are just a few of the principles that help Kanban to improve efficiency and eliminate waste in manufacturing. If you’re looking to improve productivity and streamline your current manufacturing processes, then Kanban is a great workforce solution to look into.